Released in the spring of 1995, appropriately enough, the flowery noise known as Orchid marked the beginning of one of the most putrid careers in all of "extreme Metal". Opeth was a band that was labeled Swedish Death Metal, yet also associated with Black Metal on various compilations. There is no explanation why, as this could not be further removed from the latter if they tried. As for Death Metal, that is a misleading tag as well. It takes more than harsh vocals for this to share the same classification as such albums as Left Hand Path, Dark Recollections, Into the Grave, Like an Ever Flowing Stream or even The Red in the Sky Is Ours. I was first introduced to this band due to the vocalist's work with Katatonia, on Brave Murder Day. 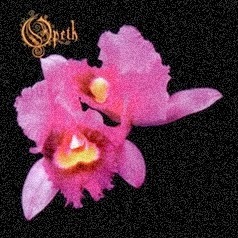 For one reason or another, whether someone lied to me or I just made an idiotic assumption, I sought out Opeth's first album with the expectations that it would be similar to that album, or even Dance of December Souls. Bloody hell, was I wrong. Orchid was not only a disappointment, but proved to be little more than a poorly written collection of... fragmented ideas. It would be wrong to call these songs, really. As musicians, these guys are quite proficient, technically speaking. They are more than capable of handling their instruments. Unfortunately, the fail miserably at actually writing songs. Of the seven tracks here, four of them extend beyond ten minutes, and one is just under. There is nothing necessarily wrong with long compositions, assuming that they are well-written and serve a purpose. These tracks are the definition of meandering and pointless. Once in a while, a decent riff will sneak in, but it is soon forgotten. A good example of this is about halfway through the first track, but even this semi-doom moment is spoiled by the overactive drumming. This is often called a mixture of prog rock and Death Metal. I know absolutely nothing about the former, but I certainly know enough about the latter to realize that these should be mixed. Death Metal is about creating a certain atmosphere. There is nothing dark about this music, whatsoever. It is light and weak and flowery and soft, not even in a sombre and depressing way. At least the old Katatonia and My Dying Bride material had feeling. Even Edge of Sanity pulled this type of stuff off better, complete with clean vocals, on The Spectral Sorrows. This is just empty and limp. Even the gimmicky acoustic bits come off as contrived and fail to add anything to the atmosphere, dead as it is. Everything is so random and useless, and the band would only get worse with this as time went on. The production is too clean for its own good. It doesn't matter too much, since the music is trash and nothing could have saved it from the boring and uninspired songwriting. Still, the plastic production would have killed it, even if there had been something worthwhile here. The drums are too prominent in the mix and the guitars sound very tame and non-threatening. Orchid is a pretentious loud of goat feces and not worth the time it would take to strip the plastic wrap from the CD case. Even those into so-called melodic Death Metal should steer clear of this. Opeth is a classic case of a band that is all style and no substance. It's heavier and darker than the last couple of offerings from Watain, but that's not saying much. Somewhere within this hour-plus of nonsense, there is a slightly below-average four-minute song, but it's not worth digging through the waste to find. Avoid this.